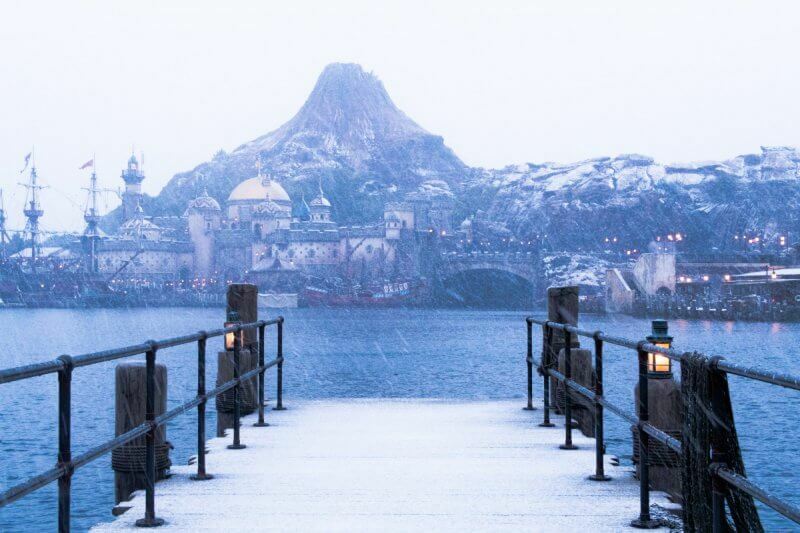 Snow at Tokyo Disney Resort is a rare sight and when it happens it makes for gorgeous photos. Along with the cold weather, it also causes transportation issues. 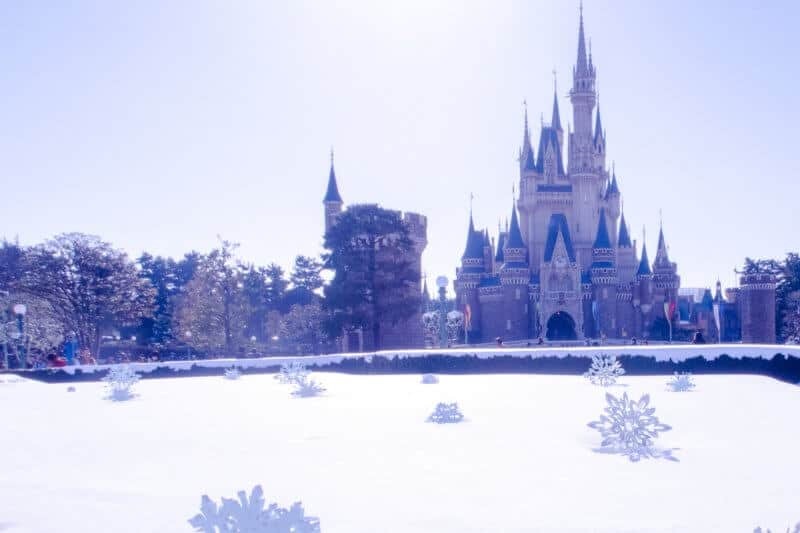 On Monday, January 22, 2018, the Tokyo area (which included Chiba Prefecture where Tokyo Disney Resort is) received around 10 cm of snow. 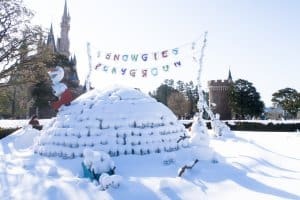 I grew up in Saskatchewan, Canada, and the amount of snow Tokyo received is nothing compared to what happens back in Canada on a normal day in the winter. But, since it rarely snows this much in Tokyo (the last heavy snowfall was back in 2014), the area doesn’t deal with it well. Transportation is the most affected by cancellations and major delays. 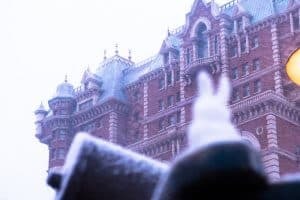 This mini photo report, I’ll share my snow experience (good and bad) at Tokyo Disneyland and Tokyo DisneySea. I’ll create a more in-depth article on what happens when it snows and how to plan and prepare for that. Our latest podcast episode discusses what to do during snow at the resort. For more photos and video check out Instagram and Twitter. 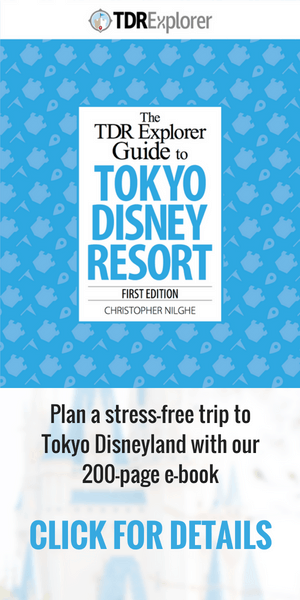 Feel free to use photos taken by TDR Explorer for non-commercial use. Provide credit to TDR Explorer if you are using on your website, blog, or social media. 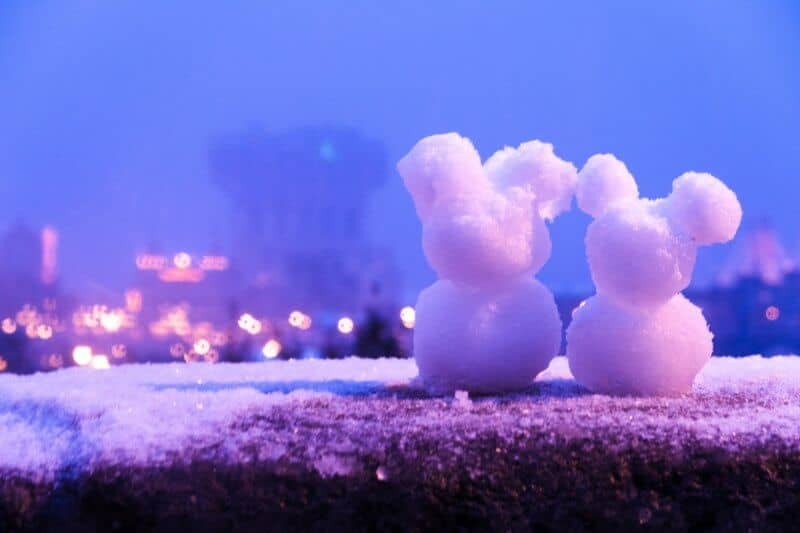 The snow began in the morning and became heavy snow in the late afternoon into the evening. I got to the resort with no problems. The snow started off more like sleet than snow, meaning it was wet and turned to rain once it hit the ground. 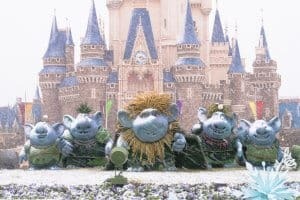 The first stop was at Tokyo Disneyland and all outdoor entertainment parades and shows were canceled for the day. The only exception was Frozen Forever in the evening, which is the nighttime projection show. 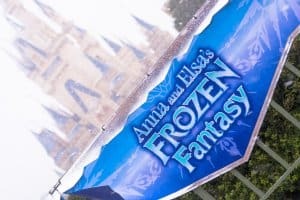 When I first arrived attractions were still running but once the snow began to increase all outdoor attractions closed. Anything that was completely indoors remained opened (the parks rarely close due to weather). The wet snow sticks to you and becomes unpleasant. I wore my water-resistant shoes from Uniqlo and that kept my feet dry (paired with warm socks) and had an umbrella. The wind made it feel even worse with the blowing wet snow that stuck to everything. Can’t blame people for not wanting to stay long. 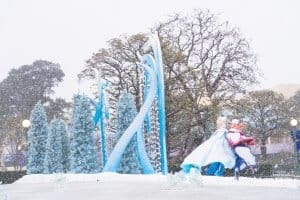 Read my guide to what to wear to stay warm in the winter while visiting the parks. The best way to dress is in layers with water-resistant clothing and shoes. 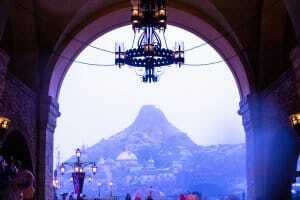 Once I had my fill of Tokyo Disneyland I took the monorail over to Tokyo DisneySea from the Tokyo Disneyland Station. The monorail ran without any issues. On a normal day, I would have walked to Tokyo DisneySea (takes about 20 minutes) but for obvious reasons, I decided to pay for the monorail. 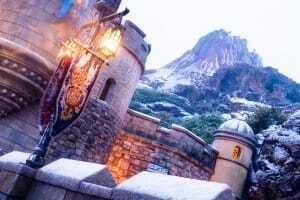 Tokyo DisneySea had reduced hours that day (closed at 19:00). This had nothing to do with the weather, these reduced hours are common for what I consider the low season at the resort. This made for a quiet park and not many people around. Anything outdoors was canceled or closed (including the Pixar Playtime games and entertainment). Closed attractions included Journey to the Center of the Earth (there’s a part that is outdoors) and all other outdoor ones. Toy Story Mania!, Tower of Terror, and everyone’s favourite Sindbad’s Storybook Voyage were still open. 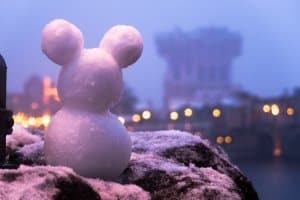 Naturally, when it snows you make snowmen and throughout Tokyo DisneySea were all these fun Mickey, Minnie, and even StellaLou-shaped snowmen (photos at the end of this post)! I even came across Duffy and Friends drawn in the snow on a table hidden away in Cape Cod. I took photos around the park and left around 17:00. If transportation wasn’t a concern I would have stayed much later, as I know the snow continued and created gorgeous scenery. As expected, trains were delayed on my way home. Thankfully, I live along one of the major lines in Tokyo and got home with minimal delays. Trains out of Maihama Station were delayed but still running. I read afterward, the trains stopped for a short period due to the heavy snow. By the time I reached my station the snow was so heavy that there was no way I’d be able to ride my bike home. I decided to walk in the snow. I had my rain gear with me, so I was able to keep extra warm and dry on the walk home. 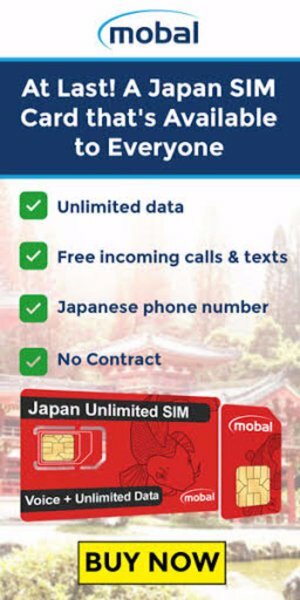 If you find yourself in a situation where you are unsure if trains are delayed or canceled, check the official JR East Website. For trains to/from Maihama station check for “Keiyō Line” or “Musashino Line” which are the train lines that run through there. There are also announcements over the intercom (may only be in Japanese and information on the train information boards (these will have English). Another option is taking the buses into the city or a taxi. Keep in mind that if the trains are stopped, everyone else will have the same idea. I recommend heading to the nearest hotel and having someone phone you a taxi from there. The following day I went back to the resort and a lot of snow still remained. 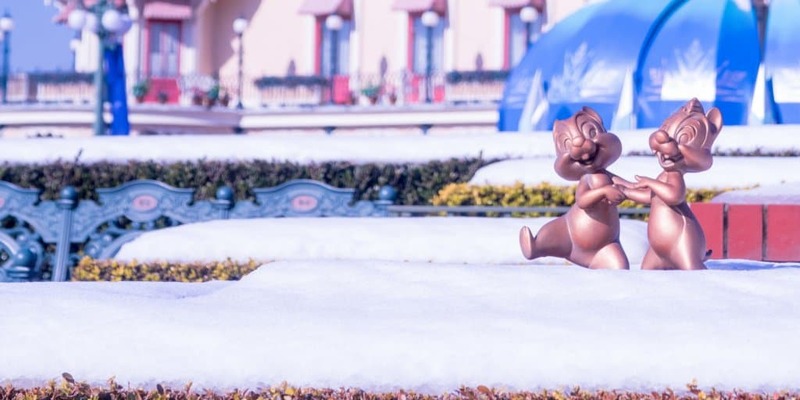 The walkways were cleared for the most part and Cast Members were clearing snow throughout the day. The sun was shining and the snow began to melt. Areas in the shade had snow for a while longer and made for good photographs. For the most part, everything had returned to normal. Attractions ran for most of the day (the early morning some were still closed to remove snow). Parades and outdoors shows were still canceled due to the wet ground and snow shoveling. 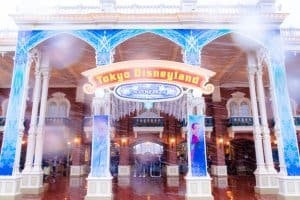 Here are more photos I took during the snow at both Tokyo Disneyland and Tokyo DisneySea. Feel free to use these photos for non-commercial purposes and as long as you give credit to TDR Explorer. 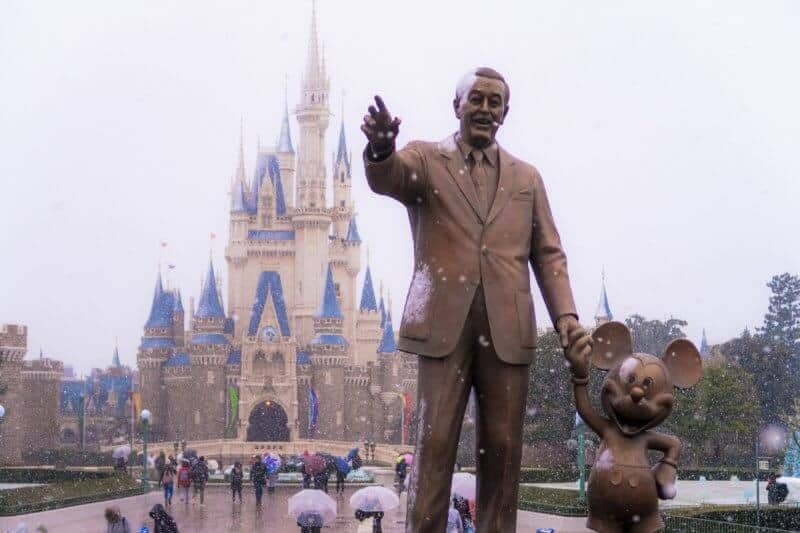 Did you get to visit during the snowfall of 2018 at Tokyo Disneyland? Share your photos in the comments! The video below is from 2014. For more gorgeous photos I recommend MezzoMiki, who has a ton more photos!